I have searched and searched and cant seem to find any media whatsoever that explains or outlines exactly how the airlock is operated. What exactly is the process you go through to open it, do you have to do a complicated procedure to depressurize or do you just flip a switch, is there a lock? I don't know! Can anyone explain the procedure, or direct me to a source that can? 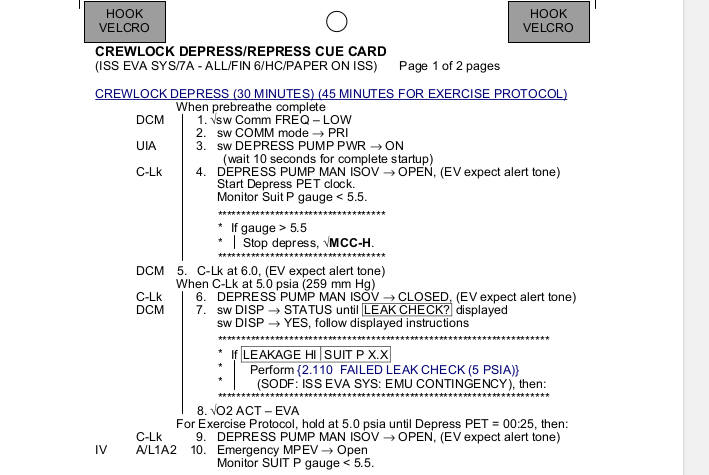 The airlock opening procedure is on the Crewlock Depress/Repress Cue Card, found in the EVA checklist on the JSC FDF page. Here is a brief decoding of the steps. 3&4 - start the depressurization pump and open the valve in its plumbing. This pump scavenges ~10 psi of the air in the airlock by pumping it back into the main body of the ISS. The starred block checks to make sure it's working. 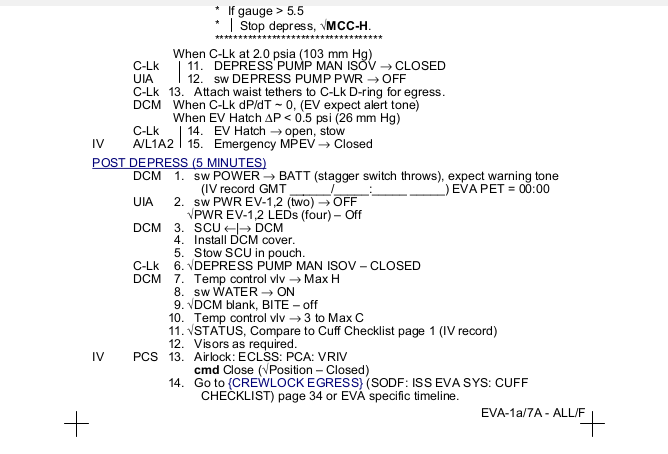 5,6,7,8 - Once the crew lock is at 5.5 - 6 psia, close the valve, and do a leak check on the suit. The starred block handles the case of a failed leak check. 9&10 - reopen the valve, and then open the Manual Pressure Equalization Valve in the hatch, to dump the remaining air overboard. The scavenge pump runs during this time to get what additional air it can. 11&12 - at 2 psi, turn off the pump and close the valve. 13 - attach safety tethers. The post-depress steps configure the suit and airlock for egress. Not the answer you're looking for? Browse other questions tagged iss eva airlock quest-joint-airlock or ask your own question. What is the cause of discoloration along the edges of the Quest Joint Airlock thermal cover? How many airlocks does the ISS have? What do the astronauts do whilst the air-lock cycles? Could a Ferroliquid airlock work? Is the inner airlock hatch kept open in-between spacewalks on the ISS? What is the mass of the Cabin Air Rack of the Quest Joint Airlock?